With the pins cut, the next step is the pare them. 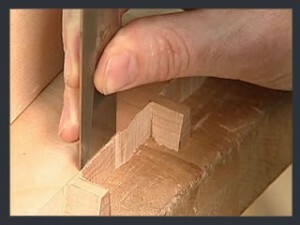 This takes a steady hand, a sharp set of chisels and plenty of patience. Take your time – rushing with increase the likelihood of a mistake. 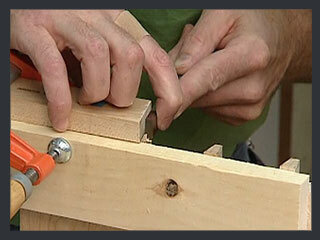 Be sure to clamp the board into place using a clamp and piece of scrap wood. Watch this video! With the pins cut, the next step is the pare them down to the marking gauge line. You’ll be working with chisels in this step. Make sure they are sharp! 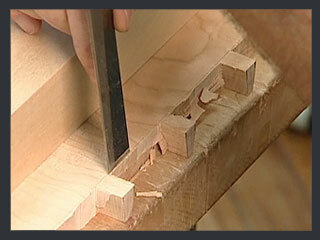 With a wider chisel, press down on the marking gauge line with a little bit of pressure. Don’t press too hard. It’s advisable to avoid using a mallet. 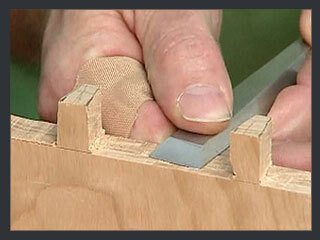 With the same chisel (or a smaller chisel), remove just the small section up to the marking gauge line. Continue this across the board, removing the small chunk right up to the marking gauge line. Use a chisel and a mallet to remove the rest of the waste. Don’t take too much wood with one cut. Only cut halfway down. Continue in this manner all along the line of the board. 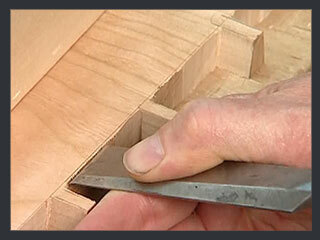 Flip the board over and follow steps #2 – #4 to chisel out the other half of the waste down the board. 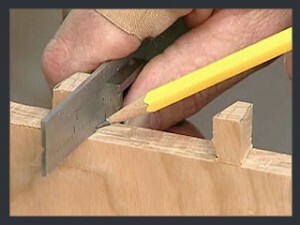 Use a chisel to pare down and flatten any high spots. Use a square to check the level. The outside and inside should both be touching the square. Continue paring to the reference line following by following steps #6 and #7. 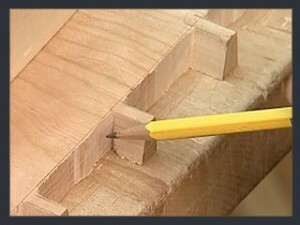 Align the paring block with one of the pins to be paired. Use a separate piece of wood and a clamp to secure the block into position. This will help as a guide as you pare down the pin. 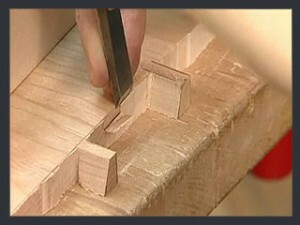 Keeping the chisel flat against the paring block, pair the pin with small cuts. Don’t try to take all the excess material with one swoop. Use a square or ruler to check your pared pin. Look for any daylight between the blade of the square and the body of the pin. Clean out any debris that remains. Continue paring the pins following steps # 8 – #10. With the pins cut and pared, it’s time to work on the tails.